My name is Peter, i am 63 years old and i was a postman for 37 years. We also managed an agency for the “de Telegraaf ” for 27 years in Leimuiden. Here we are creating 3 holiday homes (gîtes). Jaulnay is a smal village which has 260 inhabitants, a bakery and a pub. .
Why in this region? There is a saving “the nice weather Always starts beyond the Loire”. It’s a pretty varied region with rivers, nature, castles and wine,The temperature is pleasant and the distance, 800 km to our children, parents, family and friends in Netherlands is reasonble. To me France feels like coming home. Th e country with its many varieties, the poeple, nature, the culture and its habits. 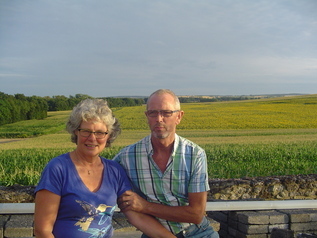 My name is marian van der geest-Straathof, i am 59 years old and have been married to Peter for 37 years. whe have 3 children, Annemarie , Bas and Herman. They are living on their own and are excited about our plans. The continental climate and the temperature are ideal for my healt. To be busy and have a good rest sometimes works fine for me. Peter’s enthusiasme and willpower make me happy and i love te make this new start with him. Jaulnay has a rustic, cozy atmosphere, with its wide vieuw, its mild climate and the deer and birds of prey are alway near, Enough challanges in the buildigns and on uor yard. We will also make sure that we take time off together and travel with the camper. We will visit fah mily and friends, go hiking and biking and i will make paintings, which is my hobby. We take french lessons, difficult but fun and certainly very important. These days it is easy to keep in touch with the home front. Uor loved ones are Always welcome of course. We are surprised how open people here respond to uor arrival. We have nice neighbors meet a lot of new people.